COMING SOON: OUR WEBINARS ON-LINE, ON-DEMAND! 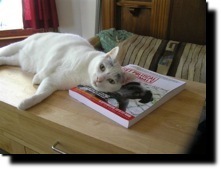 WIN STATE AND LOCAL LAWS FOR ANIMALS. Stop wasting time doing the wrong things! 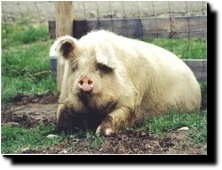 Laws to protect animals are weak and unenforced--because we aren't political! 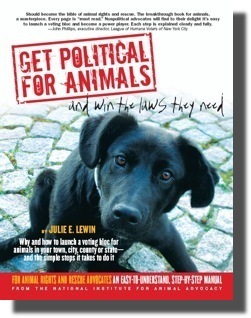 >NIFAA's highly-praised, comprehensive, easy-to-read how-to book, "Get Political for Animals and Win the Laws They Need" (see below) Written for YOU! Sponsors: Animal Legal Defense Fund ASPCA Best Friends Animal Society Dogs Deserve Better Farm Sanctuary The Fund for Animals The Humane Society of the U.S.
"GET POLITICAL FOR ANIMALS AND WIN THE LAWS THEY NEED"
It Takes to Do It"
New dates to be posted soon...or...Schedule 1 for your group or you alone! NIFAA-Nar Webinar V: WINNING EASY RECRUITMENT STRATEGIES, BECAUSE RECRUITMENT MUST BE YOUR GROUP'S #1 ACTIVITY! Tutorials: A personalized course for you or your group that requires field work and calls to discuss each lesson. An opportunity to learn political organizing and lobbying techniques directly from Julie Lewin.